Forbes is one, if not the best, scorekeeper of sports business. Forbes tracks everything in sports business from the most valuable teams, highest-earning players, top agencies and biggest sponsors in the sports world. For example, the Dallas Cowboys are the world’s most valuable pro sports team. Cristiano Ronaldo is the world’s highest-paid athlete. Nike is the world’s top sportswear brand. Creative Artists Agency is the best in the world for all sports agencies. Forbes does what no other global media company has by showing what exactly makes these teams, brands, agencies, and athletes so impressive and successful. Forbes, for the first time ever, has made a cross-category ranking of sports business influence. What exactly makes the Cowboys, Ronaldo, Nike, and CAA so successful? The Cowboys are successful because of the superstar athletes the team has every season such as Dez Bryant, Dak Prescott, and Ezekiel Elliot. The Cowboys don’t have to win for them to keep making money. The Cowboys are worth $4.2 billion, right in front of Real Madrid, and bringing in $700 million in revenue last season. The Cowboys keep getting rich because of sponsors such as Pepsi, Ford, AT&T and Bank of America. Cristiano Ronaldo is Real Madrid’s best player in history and because of that he has a massive contract with them worth $56 million with addition to more than $30 million in corporations wanting to be associated with him. Nike is the world’s most valuable sports brands and can sell $20 billion worth of shoes annually. Nike can do this because of the big named athletes associated with the Nike brand specifically LeBron James, Tiger Woods, and most of the professional leagues. Creative Artist Agency has become the most successful because of the athletes under the agency namely Drew Brees, Carmelo Anthony, Julio Jones and many more. The most interesting thing about the teams, brands, athletes, and agencies are how they become so successful. Forbes has put together a Sports Money Index that ranked 430 athletes, agencies, brands and teams, accounting for both their financial power as well as their influential relationships with others in the sports world. In the Sports Money Index, athletes are scored on earnings, agencies on their max commissions, teams and brands on their respective values. The other component analyzes the entity’s connections to the other categories in the sports world. For example, professional teams receive credit for the athletes and brands the team relates to. For the New England Patriots, they would receive credit for players like Tom Brady and legendary coach, Bill Belichick. The top brands associated with the New England Patriots are Verizon, Gillette, and Bank of America. Brands can also be scored on their relationship with certain athletes. For example, Roger Federer with Wilson or Nike, Lionel Messi with Adidas, and Usain Bolt with Puma. Lastly, Forbes’ Sports Money Index will regularly change due to several different components, but for now the index will rank team values, financial performance, athlete earnings and more. The index can be filtered using different categories, making it easy to filter between athletes, brands, agencies and sports. The research Forbes did is interesting because it shows the world of sports business between sports, brands, agencies, and athletes all in one place. Its annual valuation lists financial data into a single ranking that reflects their monetary success and how their values affect one another. Below is the Sports Money Index for the top brands in sports. 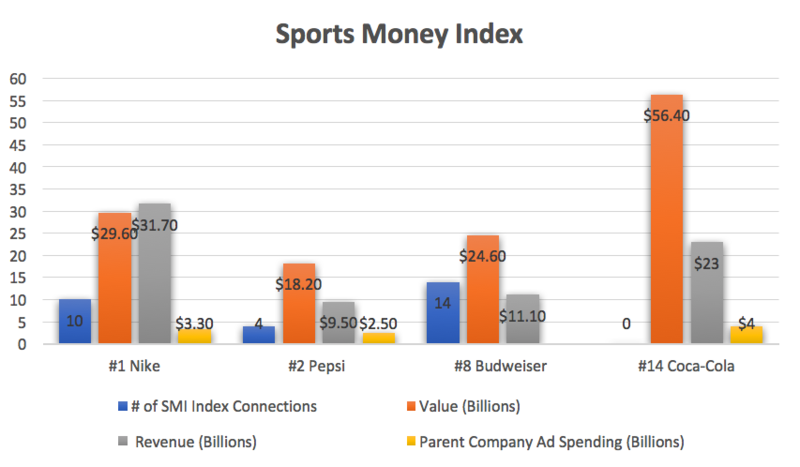 The Sports Money Index for brands shows each brand and their connections between other sports, athletes and teams in the Index. For example, Nike’s index connections consist of #6 Barcelona and #13 Golden State Warriors, including many more. Also, the index accounts for the brands value and revenue. I think this is important because it shows what brands are associated with what teams and what athletes are associated with those teams and brands. Brands are ranked on the respective values. The more top rated athletes and teams are associated with a certain brand, the better the score. 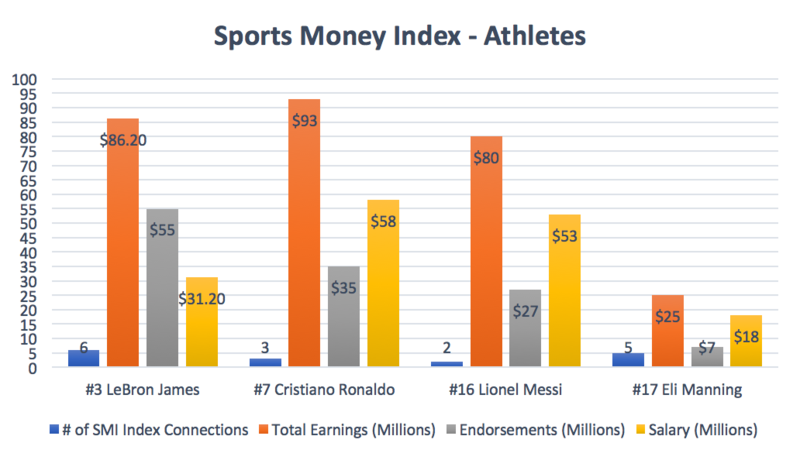 The Sports Money Index for athletes shows what connections the athlete has with other brands. Basically, what connections are associated with the name of the athlete. For example, LeBron James’ is connected with Nike, Coke-Cola, Verizon, and many more. The Sports Money index also shows the athletes’ total earnings, money from endorsements and his or her salary. The athlete index is important because brands want to be associated with the top athletes and this list gives us easy access to the top athletes and what brands they are associated with. Overall, the Sports Money Index by Forbes is the first ever cross-category ranking of sports business influence. Sports business influence shows how sport leagues are a marketing channel network with the intention to develop the business as much as the sport. Sports will always be growing in popularity and sports-related businesses will continue to generate billions of dollars a year. The Sports Money Index is interesting to see what brands are associated with what teams and athletes or vice versa. It’s thought-provoking to see how each value on a brand, athlete, agency, or team can impact one another. It’s a unique index with great access to connections around the sports world and their respective values. This blog post was written by Samford University student Sam McWhorter.